For the first time, I was scared. Really scared. Hitchhiking solo into Selma, Alabama in March 1965 had been youthfully naïve. Six weeks later, departing that civil-rights hotbed by sticking a thumb out was not only foolish—it was dangerous. On an early May afternoon, my buddy Paul and I were standing alongside Highway 80 on the outskirts of Selma, hitching west. 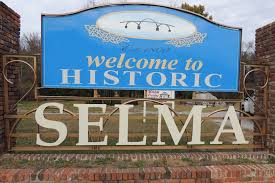 We had been working and residing in Selma during the weeks following “Bloody Sunday,” March 7, and the later successful march to Montgomery, the state capital. I was 18; Paul was a bright, energetic 16 year-old dropout activist, and we were eager tag-alongs to a movement in full sway across the southern U.S. We were inexperienced, so not of any skilled help. Our role was simply to add a couple new faces on the picket line or two energetic bodies in a march or at a sit-in. We gained a well-rounded exposure to “the Movement.” Mine included a voter-registration march that put me face to face with perspiring state troopers eagerly employing tear gas and electric shock batons—cattle prods—to break our line. In April, Paul and I had been arrested at a sit-in at a university in Montgomery, protesting segregated conditions. At one point, while in the county jail, I had the dubious distinction of being sent to “the hole,” a dark, dank, cramped isolation cell where I spent a day or two. But, being young and healthy, I don’t recall any of those experiences caused me real distress. After a week or so in jail, we were released on signature and discovered we could leave the state if we wished. With many court cases pending, the likelihood of our being called back to stand trial was low. We were both eager to get back to California. We had been warned about the danger of leaving the area on foot. As teenage males—no surprise—we didn’t heed that advice. Reluctantly, our fellow activists dropped us off mid-afternoon a ways from town, wishing us luck. But traffic was light, prospects for rides were low, and after a couple hours the sun was sinking. Suddenly we needed more than luck—we needed an escape. A dark-colored pickup truck pulled over and stopped about 100 yards away, facing us. Two burly white men got out, revealing shotguns or rifles hanging on rear-window gun racks. The “rednecks” had a two-way radio in the truck, which they used soon after they pulled up. Standing there, they were close enough that I could see the pistols on their hips. They lounged on their front fenders, spoke a few words between them, snickered and smirked, and mostly just watched and waited. At least fifteen minutes must have passed in this uncomfortable standoff. On the shoulder of the road we both realized how vulnerable we were. There were few farms or homes nearby, just open fields then woods. We tried to keep cool, but–whew! We knew we had no recourse, no way to return to safety. It was getting late. Tulsa? Tulsa!! That’s f*ck*ng OKLAHOMA! How many states is that? He shuffled into the back seat and in no time we grabbed our bags and jumped in. Behind the wheel, I adjusted the rearview mirror, dropped that Chevy into gear, stepped on the gas, and glanced back. As we hit the highway, all I saw was dust, the truck, and the two guys we assumed were Klansmen who could easily have taken our lives that evening. For hundreds of miles, Paul and I exulted in our good fortune—and reflected on what could have been our fate. © 2015. Jeremiah Cahill spent 30 years working with cooperative credit unions. On retirement in 2014, he wondered what he’d do with all his new-found time. Aside from doting on granddaughters, he discovered a penchant for writing memoir and current-events essays. Originally from Honolulu, Hawaii, he now resides in Madison, Wisconsin. This entry was posted in Guest writer and tagged Bloody Sunday, Civil Rights, Selma. Bookmark the permalink. Wow–well said, well-lived. Thanks for sharing. Great story, very well told. Thanks for documenting your personal experience in the larger civil rights movement. Phew, I’m glad it ended well. Scaaaaarrrryyy! It is amazing not only what we did when we were young, but how we perceived it. How would our outlooks have changed, depending on our color or age back then? If you had been black, the experience of the isolation cell most likely would have activated existing fears. There would have been no innocent curiosity mixed in; you would have already been there, either in person or through stories told to you. If we had been older in those days, without the unrealistic and nonchalant bravado of youth, how different would our fears and expectations have been? I suppose we might still find out about that one, eh? I remember running down a street in D.C. during a Vietnam War Moritorium, trying to escape a tear gassing, with my crazy hair, torn bell bottoms and hippie beads and the lady next to me in her big hair, high heels, and fur jacket. We didn’t say a word to each other, hostile or encouraging. We just ran together, to escape the gas. A type of silent solidarity, humanity in motion.